If you're planning an upcoming Mexican vacation, there's nothing more relaxing than spending an afternoon on a white sand beach with a margarita in hand as you listen to the sound of waves crashing. Before embarking on an international vacation to Mexico, it's important to check US Government travel warnings for the most up-to-date safety information. 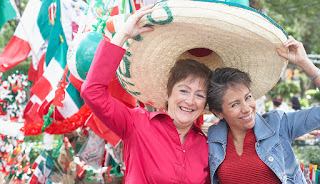 While millions of US citizens successfully and safely visit Mexico year after year for tourism or business purposes, the Government urges visitors to Mexico to be aware of the risk of kidnappings and disappearances. The best practice is to keep a low profile and avoid displaying wealth that could draw attention to you and your family while on vacation. Don't bring valuables, if possible. To go along with the first tip, leaving valuables at home while vacationing in Mexico is your best bet. If an item isn't essential, then it's better left behind. Think twice about bringing expensive jewelry and electronics. If your wedding ring isn't insured, it may be better stored in a home safe; during your vacation, a fake wedding band can be worn as a substitute. Scan and e-mail all travel documents in advance. This includes your passport. Taking this precaution will help to protect you and your family in case your passport or other travel documents are stolen on vacation. If a purse containing a passport is stolen while shopping, you can check your e-mail to quickly gain access to a copy of this vital document to ensure a safe return home. Additionally, make sure that another trusted member of your family has access to your e-mail account, such as a spouse or a parent, so that they can get copies of your travel information if you're stranded in Mexico without identification. If you plan on driving in Mexico, your US auto insurance policy won't provide automatic coverage. Since most foreign insurance companies aren't honored south of the border, you must get proof of liability from an insurance provider that offers Mexico auto insurance in order to meet Mexican legal requirements. If you don't take the precaution of providing proof of legal liability, your vehicle may be impounded, and you could be detained if you're involved in a car accident in Mexico. Don't take the risk; contact your insurance provider about getting Mexico insurance weeks before your vacation. Although necessary precautions need to be taken to travel safely in Mexico, you can still enjoy a happy, relaxing vacation by keeping these tips in mind. Traveling safely in another country means traveling wisely. Getting the necessary insurance in advance and copying all important travel documents will save you a serious headache and help you to avoid legal repercussions in the event of an unfortunate accident. After that, you can kick back, relax, and unwind on the beach to recharge your batteries on your Mexican getaway.